Freshware Food Storage Containers with Lids [24 Pack, 32oz] -ONLY $10.99! Great for Soups! Freshware Food Storage Containers with Lids [24 Pack, 32oz] – Plastic Containers, Deli, Slime, Soup, Meal Prep Containers | BPA Free | Stackable | Leakproof | Microwave/Dishwasher/Freezer Safe- ONLY $10.99! Score a GREAT DEAL on the Freshware Food Storage Containers with Lids [24 Pack, 32oz] – Plastic Containers, Deli, Slime, Soup, Meal Prep Containers | BPA Free | Stackable | Leakproof | Microwave/Dishwasher/Freezer Safe today for only $10.99 from Amazon! You will get FREE Shipping if you are a Prime member! If you are not an Amazon Prime member you can grab a FREE 30-Day Trial HERE! Get the all the Details of this deal below! SAVE TIME AND MONEY: Most plastic containers don’t last for a long time. They crack after a few uses and melt in the microwave. Not Freshware, our heavy duty lunch containers are built to be more strong and reusable than our competitors. HEALTHY MEAL EVERYWHERE: Featuring deli containers with portion control help you keep your 21 day fix meal plan and lose weight. These food storage containers can also be used as school lunch box, last night’s dinner, or slime containers for the kids! SAFE AND EASY TO USE: Made from BPA, PVC, and Phthalate free materials, these meal prep containers with lids for meal prepping are 100% food safe. 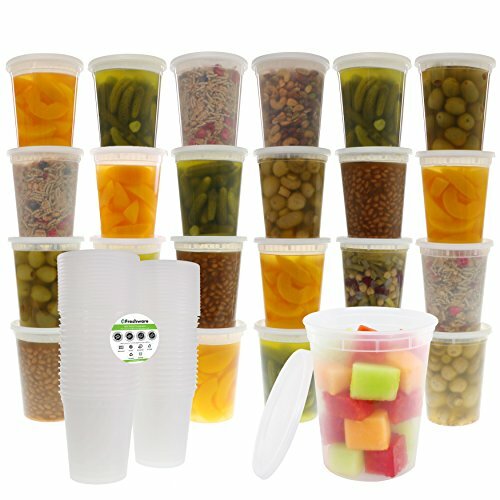 Stackable, airtight, and leak-proof when closed, these food savers can keep your food fresh and organized. MICROWAVE, DISHWASHER AND FREEZER SAFE: Made of the highest quality food safe materials, these bento box can withstand temperatures from -40C to +120C (-40F to 250F) – so enjoy without worry about harmful chemicals or plastic leaking into your food. SATISFACTION GUARANTEE: Freshware plastic food containers are meant to help you eat healthier and save money by cooking at home. In the unlikely case that your containers are not perfect for you, just send them back for a full refund or replacement! Stay Fit And Healthy – Enjoy Nutritious Homemade Meals Everywhere With The #1 Food Storage Containers By Freshware! Are you sick and tired of spending money on buying readymade unhealthy food? Meet The Ultimate Meal Prep Containers, Your New Best Friend In The Kitchen! Provide yourself and your kids with a decent meal prep of controlled portions with main course, salad, baby food, dressings, condiments, sauces, fruit, soup and healthy snacks, all nicely packed in this super convenient bento lunch box container. 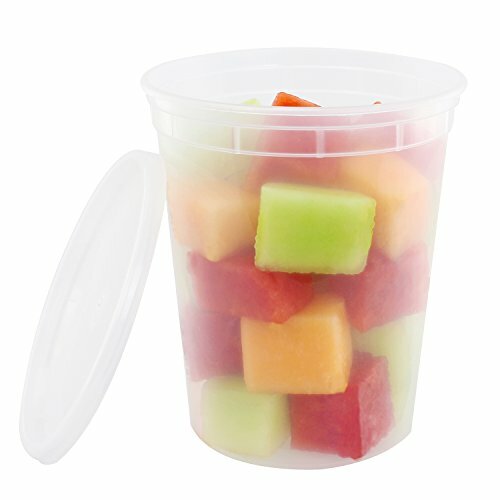 These food savers can also be used as school lunch box, last night’s dinner, or slime containers for the kids! Supreme Quality and Premium Design Combined! These reusable lunch containers with lids for meal prepping are made from 100% BPA, PVC, and Phthalate free food-safe material. Stackable, airtight and leak-proof when closed – these deli containers won’t let your food spill all over the pace. Our clear lids and 32 oz containers make it easy to see what’s inside so you know exactly what you’re grabbing for in the fridge or lunch box, making life so much simpler. Microwave, dishwasher, and freezer safe! Our easy open lids are made with flexible PET plastic that will never break. – Prepare more meals in advance and freeze them for the busy days when you won’t have time to cook. – Microwave them to enjoy a delicious hot meal. – Clean them hassle free in the dishwasher top rack. Box Size: 4.6 inch top diameter x 3.4 inch base diameter x 5.4 inch height. Volume: 32 ounce/1 quart. Pack of 24. These Meal Prep/ Portion Control/ 21 Day Fix/ Food Storage Containers are a great new alternative to expensive plastic containers. Perfect lunch boxes for kids or bento box for work, while they are highly recommended by most fitness experts. Don’t miss this deal at Amazon Today on the Freshware Food Storage Containers with Lids [24 Pack, 32oz] – Plastic Containers, Deli, Slime, Soup, Meal Prep Containers | BPA Free | Stackable | Leakproof | Microwave/Dishwasher/Freezer Safe for only $10.99! Previous Post: Sharpie Permanent Markers, Fine Point, Assorted Colors, 12 Count – $7.99! Next Post: Halloween Tic Tacs – Only $0.50 @ Target with Printable!